The client is a dedicated fruit processing equipment manufacturer with over 70 years into the business. They worked towards building a wide a range of machinery for their customers to produce top quality products with unmatched operating efficiencies while at the same facilitating higher savings. Based out of Pueblo, Colorado, USA, the client has offices located across the globe. Nicknamed gold standard of fruit processing equipment, the client's equipment is a proud offering that serves their customer with not just superior performance, but also better customer services as well. The client required support to create manufacturing drawings from existing 3D SolidWorks and PDF files that carried legacy data on equipment designs. The designs of those fruit processing machines mostly required to follow the ASME Y14 standard to meet the growing demand for advancements in equipment manufacturing. The client looked for an established engineering support services provider to take up this work and ensure higher level of data security as well as highly detailed designs that carried all the specification marked in the PDFs provided. The challenge was to create engineering drawings based on the rough PDF sketches. The existing set of drawings didn't carry any standard specifications and posed a challenge while ensuring that international standards were met whilst not altering the base design in a big way. Outsource2india with over two decades of experience in 3D modeling and rendering was able to provide better than expected results to the client. We engaged a team of six skilled drafters along with one quality control analyst and accounts manager for a smooth execution and delivery of this project. Close to 408 drawings had to be incorporated to the ASME Y14 standard. Our team was able to deliver the project in about 60 working days with weekly review meetings and quick revisions to the client. We at Outsource2india use tools like AutoCAD, SolidWorks, Inventor, Pro/Engineer, CATIA, and I-Deas, etc. to provide better results at a lower expense. We have a proven track of satisfied clients from automobiles, aerospace, piping, packaged food, electronics, and consumer goods, telecom, medical devices, marine vessels, process industries, and general engineering. We boast of a highly skilled and creatively motivated team of modelers, drafters, and designers who deliver 3D modeling services for various industries. 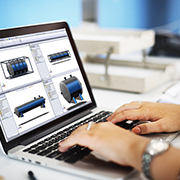 Contact us for understanding how we can help you with SolidWorks drafting. Outsource2india's AutoCAD conversion services is leveraged by global clients from 20 years. We have successfully proven on several occasions that partnering with us will lead to promising results. Our services have helped clients to dynamically transform legacy designs into functional drawings that adhered to latest industry standards. All this while keeping the cost affordable and results more accurate. With every new milestone, we steadily continue to grow our loyal client-base. Backed with a team of highly trained staff and sophisticated engineering technologies, we offer solutions that are cost-effective and reliable. Other services we offer includes CAD conversion services, mechanical CAD drafting services, 3D part Modeling services and more. If your business require AutoCAD conversion of legacy designs, get in touch with us and we will make it happen.